DNA Diagnostics-Testing Market Is Expected to Witness Higher Demands Till 2022: Grand View Research, Inc. According to report published by Grand View Research, rise in developments in the field of genome sequencing and personalized DNA level diagnostic applications, a considerable growth in the number of patented research initiatives by the government and government funded projects are factors expected to drive demand during the forecast period. According to a report,“DNA Testing/Diagnostics Market Analysis By Technology (Microarray Based, PCR Based, In-situ Hybridization, NGS DNA Diagnosis), By Application (Pre-natal DNA Carrier Screening, Pre-implantation Diagnosis, Newborn Genetic Screening, Infectious Disease Diagnostics (HBV, HCV, HIV, TB, CT/NG, HPV, & MRSA), Oncology Diagnostics & Histopathology, Identity Diagnostics & Forensics, Pharmacogenomics Diagnostic Testing, & Drug Metabolism/P450 Effects), And Segment Forecasts To 2022”, published by Grand View Research, Inc., Global DNA testing market is anticipated to reach USD 10.04 billion by 2022. Rise in developments in the field of genome sequencing and personalized DNA level diagnostic applications, a considerable growth in the number of patented research initiatives by the government and government funded projects are factors expected to drive demand during the forecast period. PCR based diagnosis accounted for the largest share of the market revenue in 2014 as a result of higher preference rate coupled with higher availability of products and reagent kits of this segment. Next generation sequencing application for DNA testing is estimated to witness significant progress with a double digit CAGR of over 16% amongst the other technology segments due to presence of significant advantages offered by this technique of DNA identification and testing. 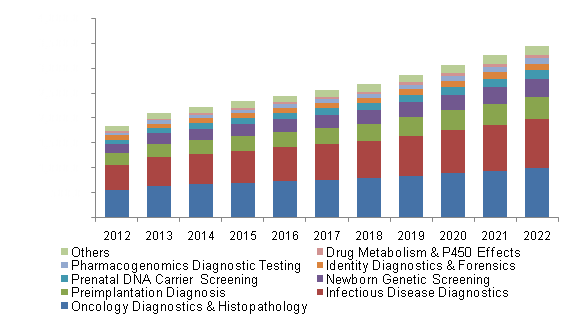 Infectious disease diagnostics accounted for the largest market share in 2014 due to higher incidence rate of various infectious disorders which subsequently raises the demand for in-vitro nucleic acid based diagnostic tests for diagnosis and monitoring of disease progression. North America dominated the market in 2014, with revenue estimated at over USD 2,600 million. Presence of sophisticated healthcare infrastructure, rising incidence of genetic abnormalities, favorable government initiatives with respect to genetic diagnosis and its application in in-vitro fertilization are major factors driving growth of this region. Asia Pacific is anticipated to witness lucrative growth as a result of developments in health care infrastructure in this region coupled with presence of significant number of target population that is suffering with chronic as well as acute disorders. Government initiatives taken up herein are also attributive to influence sector growth to a great extent. Key participants of DNA testing industry include Abbott Laboratories, Agilent Technologies Inc., Illumina Inc., Beckman Coulter Inc., Bio-Rad Laboratories, Thermo Fisher Scientific, Applied Biosystems Group, Cepheid Inc., Transgenomic Inc., Siemens Healthcare, Roche Diagnostics, Qiagen, Illumina, GE Healthcare, Alere Inc, Affymetrix Inc., Hologic, Dako, and 454 Life Sciences. Bioinformatics Market: Growing clinical development of biopharmaceutical and increasing need for three dimensional drug designing technology are expected to drive the bioinformatics market growth over the next five years. Carcinoembryonic Antigen (CEA) Market: Constant technological advancements pertaining to the development of novel biomarkers which can be used in combination with other biomarkers is expected to boost usage rates over the forecast period. Introduction of novel technologies for genome profiling are expected to boost progress of this industry over the forecast period. Furthermore, increasing incidences of chronic oncology and infectious diseases that depend on DNA prototyping for treatment and diagnosis using personalized medicine are anticipated to significantly raise demand for DNA diagnostics/testing based research thereby propelling industrial growth in the coming years. Increasing demand for prenatal testing and in-vitro fertilization that subsequently leads to rise in demand for DNA diagnostics/testing is also attributive towards expected progress in this market. Explore dna diagnostics-testing market research database, Navigate with Grand View Compass, by Grand View Research, Inc.